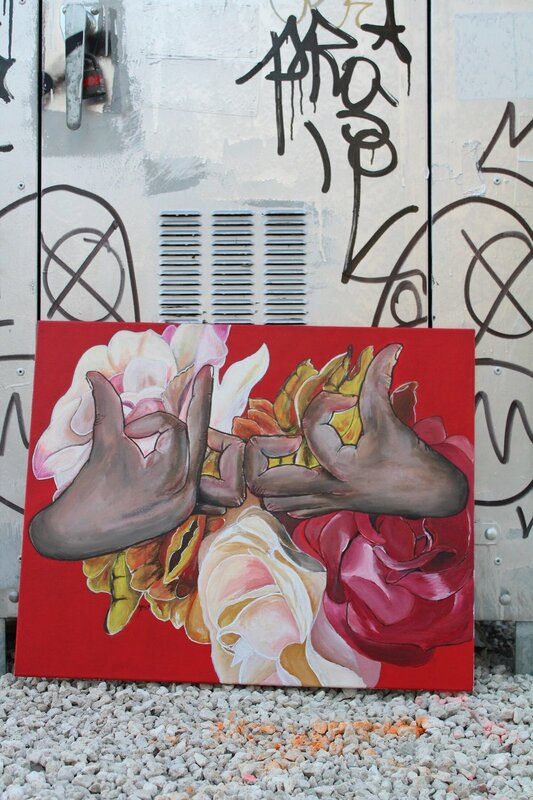 Emerging artist Mauricio Forero, who goes by the name MF13, mixes urban hip-hop culture with nature and wild life. Infatuated with illustrating his own hands, the self-taught painter illustrates mostly on canvas with acrylic and oil mediums. He represents his work with the environment he has been exposed to. Mauricio was born in Bogota, Colombia. At the age of seven Mauricio and his family moved to Jersey City, New Jersey where he was introduced and influenced by the strong Latino/African American community. Several years later he and his family moved to North Florida where he was introduced to the outdoors and wildlife. After falling in love with fishing, he began illustrating fish native to the Southern Coastal Region of the United States. Mixing his art of beloved hands and fish has brought him recognition from artists like Rigo Leon from Miami, Florida. Collaborating on a painting together has tremendously inspired him, pushing him to expand his craft and create one of a kind murals in which he implements a cellophane material-a medium not typically found on walls.